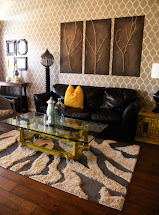 Friends, I posted about my entry to win a room makeover from the fabulous Mandi Here. Well, the time is now come to go wild and vote! You just need to go to Mandi’s blog HERE and cast your vote for #40. That’s my post about my boring, colorless bedroom. And then after you have voted, you can post a link to the contest on facebook and ask your friends to vote for me, you can post on your blog and ask your readers to vote for me, and you can call your mom and ask HER to vote for me (that’s what I’ll be doing, at least). You don’t have to have a blog to vote (at least I don’t think so) and you don’t have to have a facebook account to vote, you just need an email address. 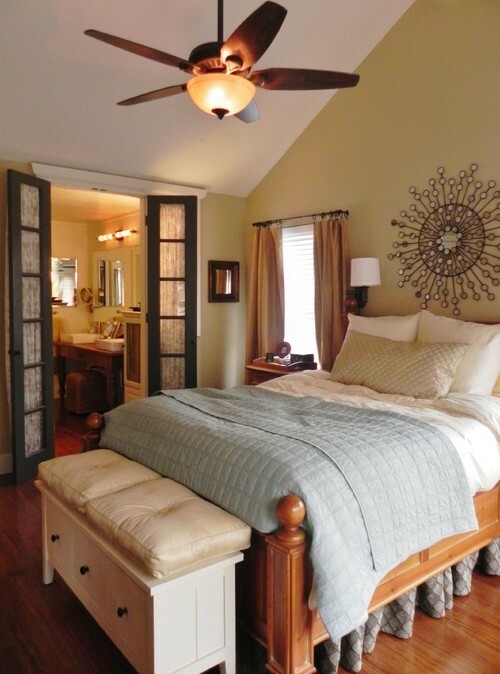 And I could REALLY use your votes, cause I totally would love to have a bedroom makeover!!! Voting runs from midnight tonight (April 30) until May 2nd. “What? Where’s the note? When is the concert?” I’m really out of the loop, apparently. So, I throw some shoes and a jacket on over my pajamas, write out a bunch of lunch money checks, make sure John has some honey-nut cheerios, and get in the car. It’s pouring rain. No, it’s snowing. Wait, isn’t it the end of April? As I drive her through the snow turning to hail, I see the Hawaiian ice shed is now up. Am I in some kind of alternate reality? Nothing makes sense this morning! And daughter number 1 proudly shows me her learners permit. It’s crazy, I tell you! And I promise I don’t drink or do drugs. It just feels that way. That must have been one strong episode of Castle last night. Let’s talk about the bedroom, shall we? 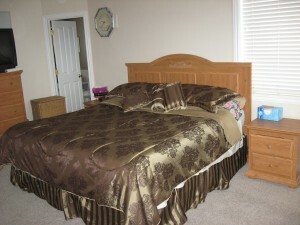 The bedroom is supposed to be “the sanctuary”, the “oasis of calm”, “where the magic happens” and all that. Right. When we got married, we used my husband’s old WATERBED that he had used for about 10 years. A waterbed? Really? You know how much fun it is to be pregnant and try to get out of a waterbed? Yeah. Real fun. So when we moved into our current house almost 10 years ago, we did not bring the waterbed with us. It felt like totally luxury to be sleeping in a REAL bed, on a REAL mattress. 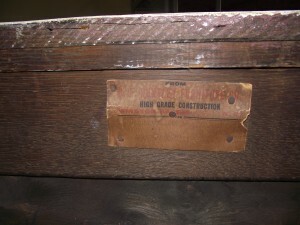 Not the highest quality furniture, I assure you. We were moving into a bigger house with a bigger mortgage, and at the time of our closing and move, my husband was unemployed. That’s right. Unemployed. As in, we really had no way to PAY for the nice new house, and were living on faith that he would soon find a job. He DID eventually find a job, and we were always able to pay our mortgage. And as the family has grown and changed, I’ve had fun painting the kids’ bedrooms, and even painted our family room and living room. But NOT the bedroom. 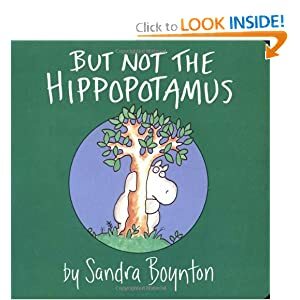 Funny, I just thought of the Sandra Boynton Book, But Not the Hippopotamus right there. You know, how all the cats and rats in their new running hats…. I LOVE that book, don’t you? Well, that’s how our bedroom has felt. 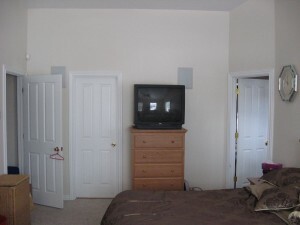 Every other room gets some kind of paint job or work done on it, but the bedroom is left out. It’s not like I haven’t TRIED. I’ve moved the bed around the room, trying to find the ‘right’ place for it. I’ve even made curtains. 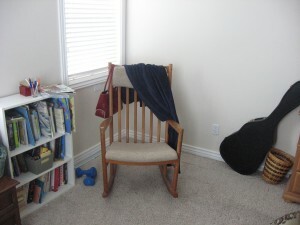 I’ve brought in a bookcase, taken out that bookcase when I needed it for the girls’ room, brought in a cute little rocking chair that I inherited from my grandma (but it just seems to be a place to hang clothes on it, let’s be honest). I’ve tried. But I can’t seem to commit to anything. I haven’t figured out what I WANT that room to look like. I’m not complaining about my room. We have a bed and dressers and a tv. It’s functional, just not fabulous. But there’s no STYLE. There’s no PERSONALITY. There’s no COLOR. Nate Berkus would tell me to paint the walls a nice soft blue or green and then go with neutral or white bedding, right? But would he tell me how to position my bed with the windows that aren’t symmetrical, or what to do with the shelf on the wall, or how to make the room really SPECIAL? Yes, I’m sure he would. But sadly, Nate has not volunteered to come out and do a bedroom makeover. BUT– We have the next best thing! 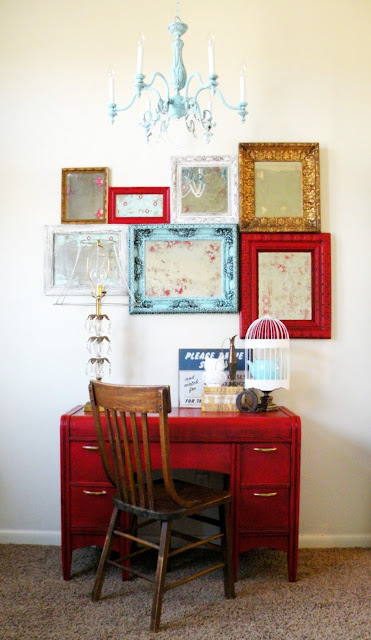 Mandi at Vintage Revival has been called the MacGyver of DIYers. 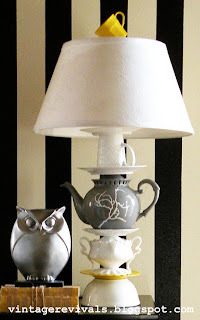 I discovered Mandi when she made this teapot lamp on Studio 5. I think she can make anything look pretty, and she doesn’t seem to be afraid to tackle ANY kind of project. She could probably make a quilt out of gum wrappers, make a sofa out of old tires and patio furniture, and I’m sure she could do WONDERS with my bedroom. Because talented Mandi is holding a CONTEST! A contest, wherein the winner of said contest (hopefully ME) gets to have the lovely Mandi come to their home, and makeover a chosen room. I could have MANDI in my bedroom! Wait, that didn’t exactly come out right. Mandi could help ME decorate our bedroom! We’d be all painting together and doing some kind of fun glazing technique on the dresser, making window treatments, and I would feed her brownies and run and get a Cafe Rio chicken salad for her while she’s working hard designing and making something MARVELOUS out of my bland bedroom. We could chat about our mutual love for Nate (while I have attended Nate’s show, she has actually been a GUEST on his show! How cool is that?! ), and be BFFs forever! And you know, if she saw other boring areas in my house that were crying out for some kind of cool clock or fireplace mantel or….something…I sure wouldn’t stop her from taking over my entire house, because I’m sure she could do wonders with it! So all I’ve got to do is win this contest! Easy, right? Not so easy. This is where YOU come in. This post is linked up to the Vintage Revivals Contest page and then, once the voting is open, from April 30 to May 4th, we all vote for me! Perhaps through our collective charm and charisma, we can get all our friends to vote for me, and our friend’s moms to vote for me, and that one creepy friend who stalks your blog to vote for me. If you feel inclined to post this on your blog and ask your readers to vote for me–all the better! I have had this dresser for about forever. Seriously. I remember it from when I was a kid. 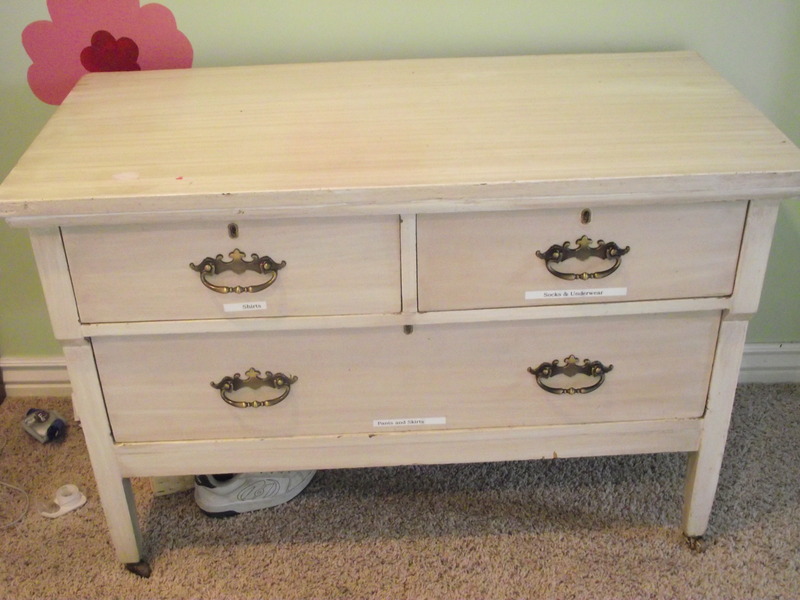 And, when we had a couple kids and needed more and more dressers, I inherited this one back from my parents. I do not know how old it it, but it’s got a couple of coats of paint on it. I do know that unlike a lot of our furniture, it’s made of wood. Not just particle board with a little bit of wood on the front. There’s a tag on the back, but I can’t read a date or anything, but let’s just say it’s old. A few days ago, a received a REALLY COOL sample in the mail. I had signed up with Valspar Paint for a sample, and this is what they sent me. 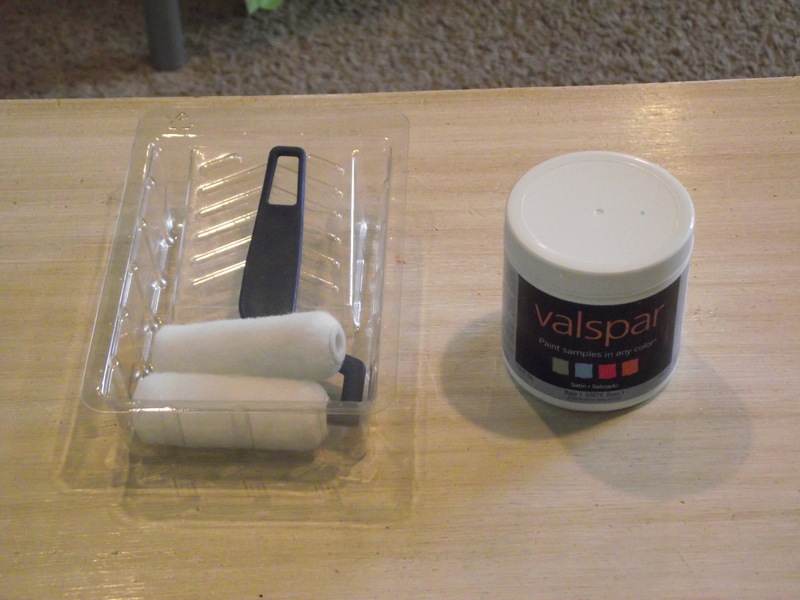 A little jar of my chosen color, also a mini roller, and a $5 coupon for valspar paint. I had chosen a light blue, “beach sparkle,” I think it was called. 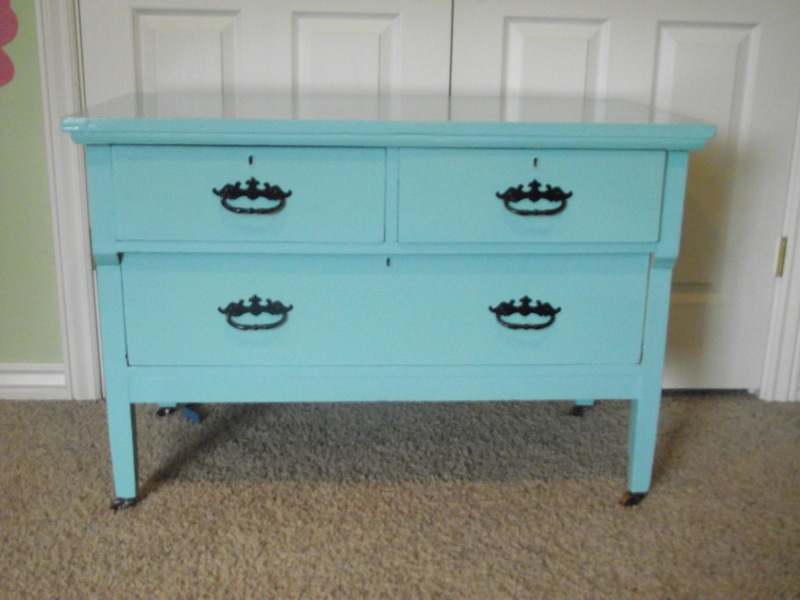 I didn’t want to paint a wall, though, I had ordered it with this dresser in mind. I started with a Mr. Clean Magic eraser and scrubbed the heck out of the piece. 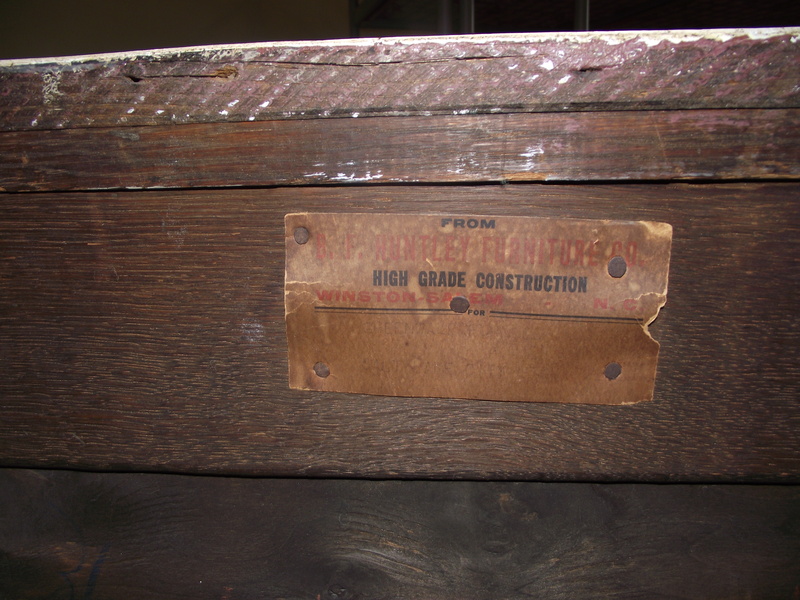 Yes, I know–real painters use sandpaper. But I am not a professional or anything, so I just cleaned it, not sanded it. 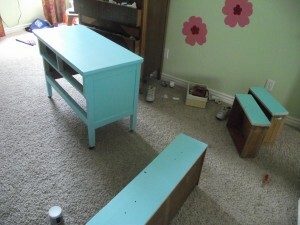 I started with only the top, because I didn’t know if I would have enough of the sample paint to do the whole dresser. There was also some tape and labels that had to be peeled off. You can tell I was really careful with this dresser in the past, since I had put labels that said “shirts”, “underwear and socks” and “pants and skirts” on the drawers. Peeling those off took off some paint, but hey, I don’t care so much. There I was, in my pajamas, (what? You don’t paint in your pajamas? For some reason I do my best painting in my pajamas. Once the kids are gone and I’m figuring out what to do with my day, that’s when I get the inspiration to paint. And I don’t want to paint after I’ve had a shower, so I end up just painting in my pajamas. Ok, so I’m weird that way), blasting some Foo Fighters and Glee, and painting. 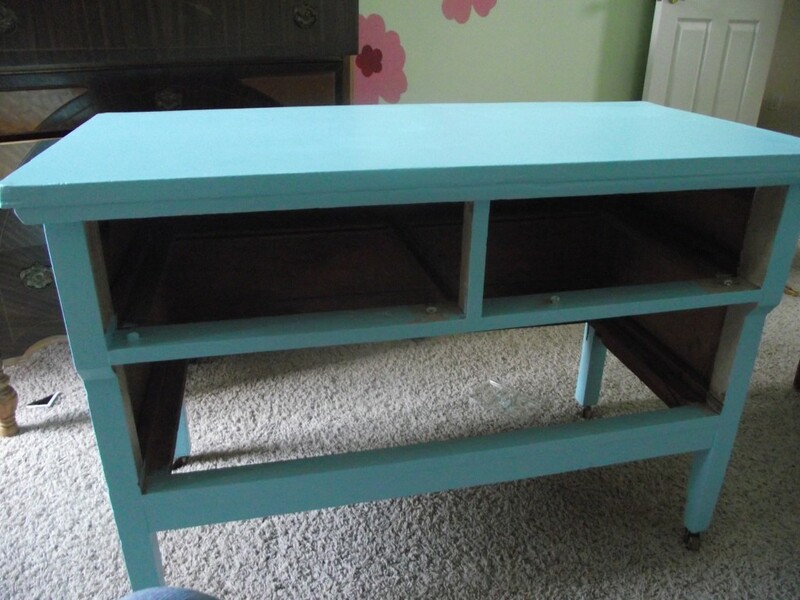 I found a screw driver and took off the handles (different color underneath, but I’m not sure if it was from fading, corrosion from the handles, or if the last painter just went around the handles), and painted the drawers. I had JUST enough paint to do a whole second coat! I love that spring blue color, don’t you? I wasn’t sure what to do with the handles. It would be fun to put on fun new handles, but that would mean a trip to Home Depot or Lowes or something, and then what if I didn’t get the right size? So, I thought I would just paint the handles and put them back on. 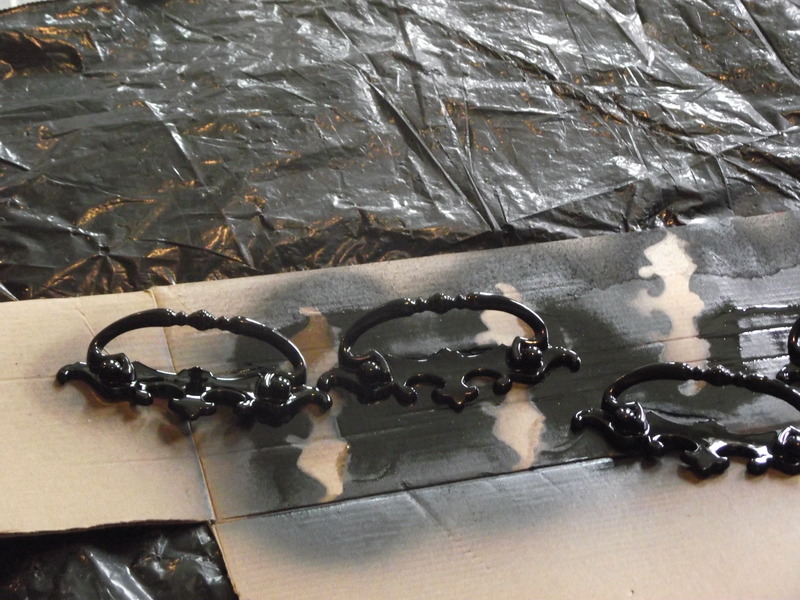 And, lookie there, I have some black spray paint. So, it’s a done deal. I spray painted the handles black, then gave them a coat of gloss, put a coat of polyurethane on the dresser, and BAM! 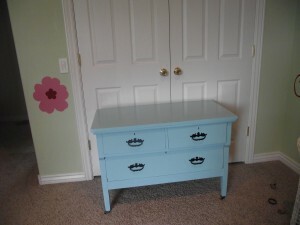 Now, if I were to do another dresser this way, I would make sure to take it to the garage or basement to paint it, not leave it there smelling the kids’ rooms up with the smell of polyurethane. When I came home from rehearsal, I could smell the smell as soon as I walked in the house, and I couldn’t believe the kids were sleeping in the same room as the smelly dresser. So we moved the whole thing into the laundry room and shut the door, so it could continue drying for the rest of the night, and stop stinking up the bedroom. But by morning, the smell was mostly gone, and it was ready to be assembled. I LOVE, LOVE, LOVE how it turned out! I love it so much, in fact, that I’d like to steal it for somewhere else in the house, not waste it on a kid who doesn’t even put his clothes away. I think it would look really cute in the entryway or in the kitchen with tablecloths in it. But for now I’m just happy with how it turned out. It’s not perfect, and there are some poly globs on the top. If I were a professional (and remember, I am NOT), I would sand that top layer and then put another layer of poly on the whole thing just to make it more smooth, shiny, and durable. The best part? Free. 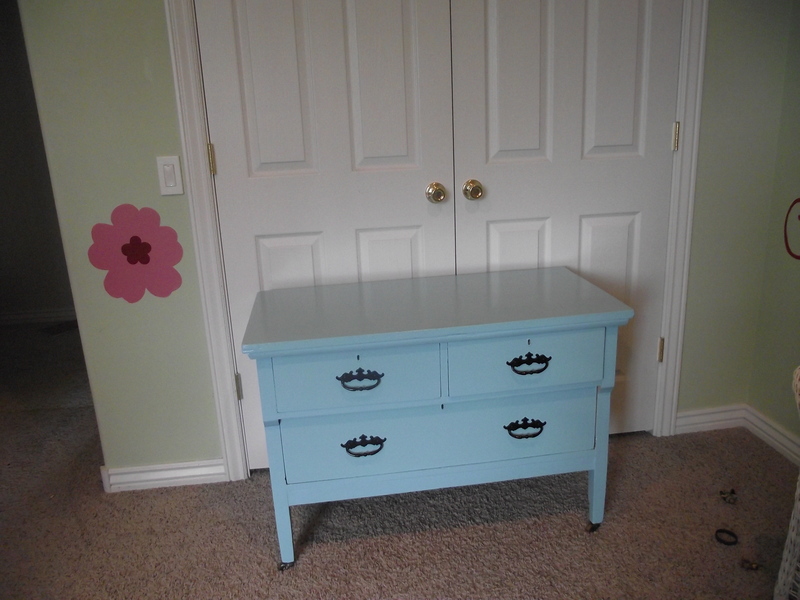 The paint was free, the dresser was free, the handles were free. I didn’t even have to go to the store ONCE for this project! And it gives me hope and inspiration. 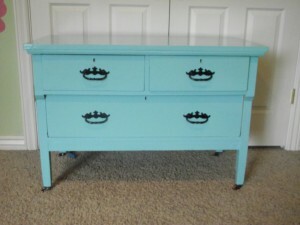 I could paint EVERYBODY’S old garage sale/hand me down dressers and make them ALL pretty and cute! I said I could. Could. Not that I have to. How many people do you know who get exited when looking at their reciept? I am loving Wal*Mart right now! It seems they will price match anything and everything, and, since there’s a Ridley’s Market that does double coupons on Tuesday, WalMart in Utah County will ALSO do double coupons on Tuesday. 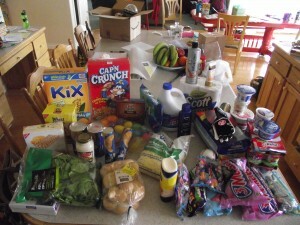 I went last Tuesday to check it out, after seeing word of this fun even on one of the coupon/money saving blogs. They said they would double anything up to 50 cents, so that the 50 cent coupon is worth $1. So, I got out my small coupons and went in. I also had a couple of larger value coupons for some personal item stuff, and since the WalMart price was good on those, I went ahead and used the coupons. Imagine my shock and surprise when the nice check-out lady doubled ALL the coupons, even the $2.00 ones! Can I get an “Amen”? Oh, yeah. Now, our little WalMart in already an anomaly in the world of WalMarts. It’s never crowded. I’m not kidding. I never have to wait for a check out, and if I do, there’s only one person in front of me. It’s new, it’s clean, and it’s only about 2 miles from my house. So, today I took a bunch more coupons, and spent some time figuring things out (couponing takes times, friends, don’t think you can just rush in there and save a bundle with coupons without putting in a little time), and when I checked out, I was EXTREMELY pleased that she doubled all of my coupons….AGAIN. I had roughly $24 worth of coupons, and they doubled all those, that I got almost $50 off my haul. All that stuff on the counter (and you might notice I have a couple of baseball items–no coupons on those, and that added about $13 right there) and a few produce items without coupons, and I discovered the I needed bleach, since the one I had expired in 2008) only cost me…. $93.01. Probably not as good as you thought it would be if you had watched that extreme coupon show about ladies who buy truckloads of groceries for $4, but I only have one newspaper, and I haven’t bought any coupons off the internet. 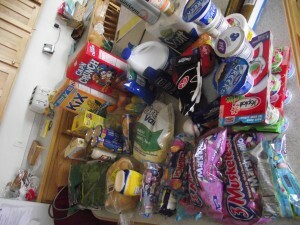 This picture shows little different angle, and leaves out the basket of fruit, which I did NOT purchase at Wal*mart today, but from my bountiful basket on Saturday. I hope they do the double coupons again EVERY week. On some items, it’s not worth it to use the coupon and buy the name brand, but sometimes, and especially if they double it, it IS worth it. It’s our Spring Break around here, but we haven’t been totally slacking. Yes, there has been some sleeping in and some lounging around reading books, but we can’t do THAT all week, could we? Well, some of us could. Others are wanting to be more entertained. Cole, actually, is the lucky one this week. Ryan’s brother called Sunday night to see if Cole would like to go to Disneyland with them the next day. Their son had invited a friend, who had to have emergency surgery and couldn’t go. So, Cole got to go. which is nice, since he didn’t go with us when WE went to Disneyland in January. So, he’s having a totally different spring break than we are! Monday night we went to Provo to see the Carl Bloch exhibit at the BYU museum of art. If you haven’t taken the chance to see this FREE exhibit, you really should. 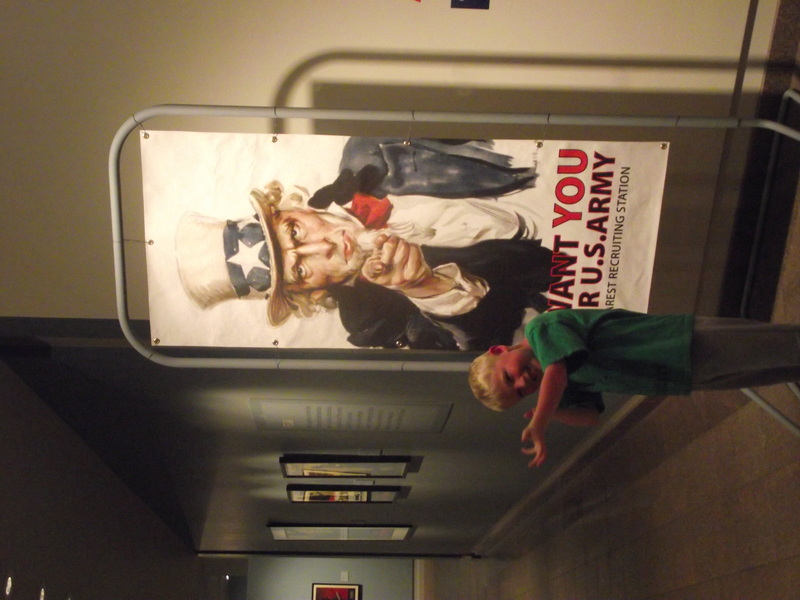 We wandered through a few other exhibits, too. 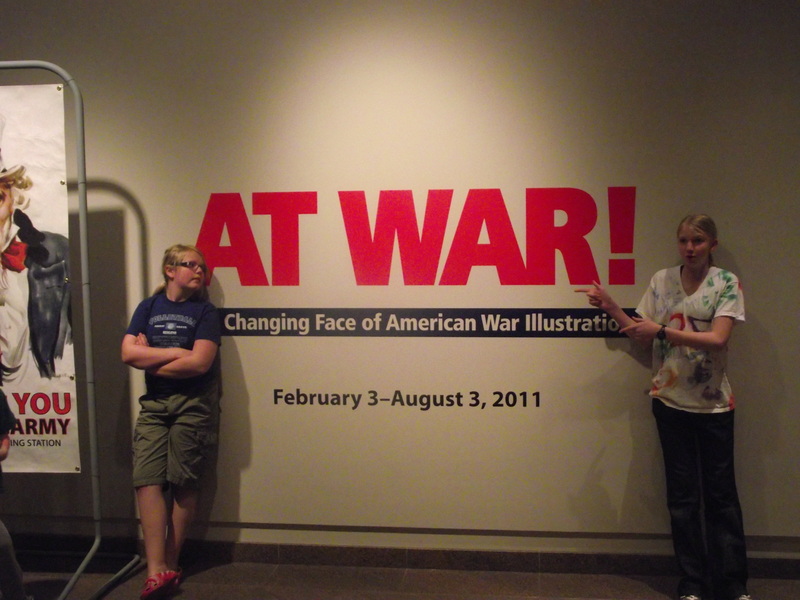 Strangely enough, the kids really liked the war posters. 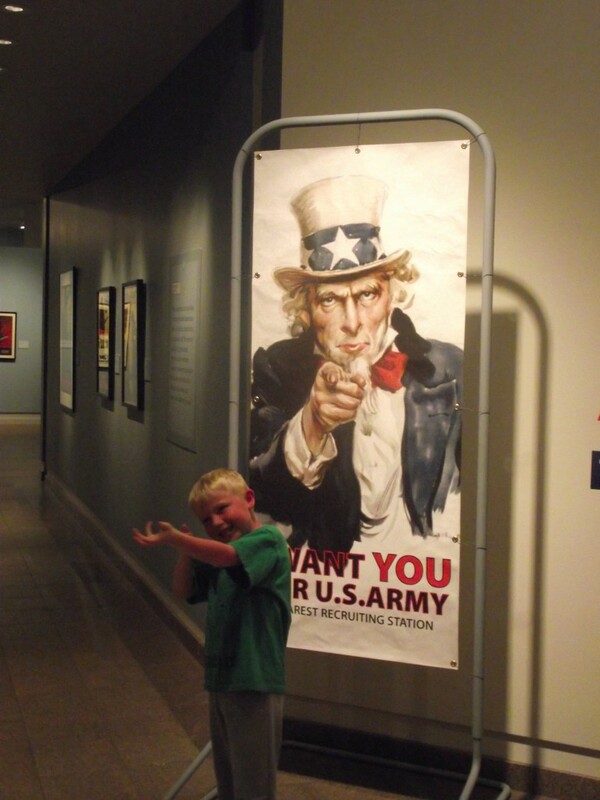 We had to explain things about ‘saving fat’ and war bonds and things, but it was an interesting display. 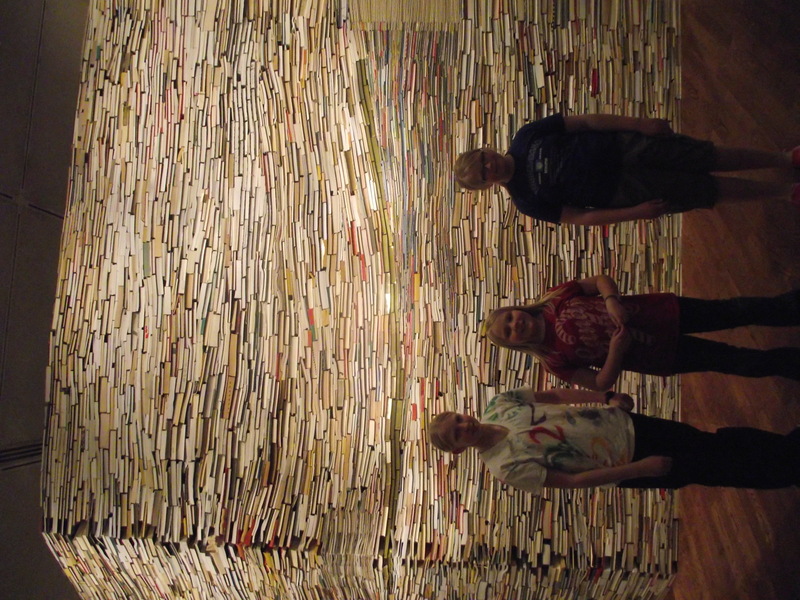 We also liked this huge stack of books. Yes, it’s art. And very cool. A $5 bucket of chalk is definitely a spring break necessity. The kids and friends spent several hours (on the one nice weather day) drawing with chalk. Yes, they’ll probably go through the whole box in one week, but that’s ok. 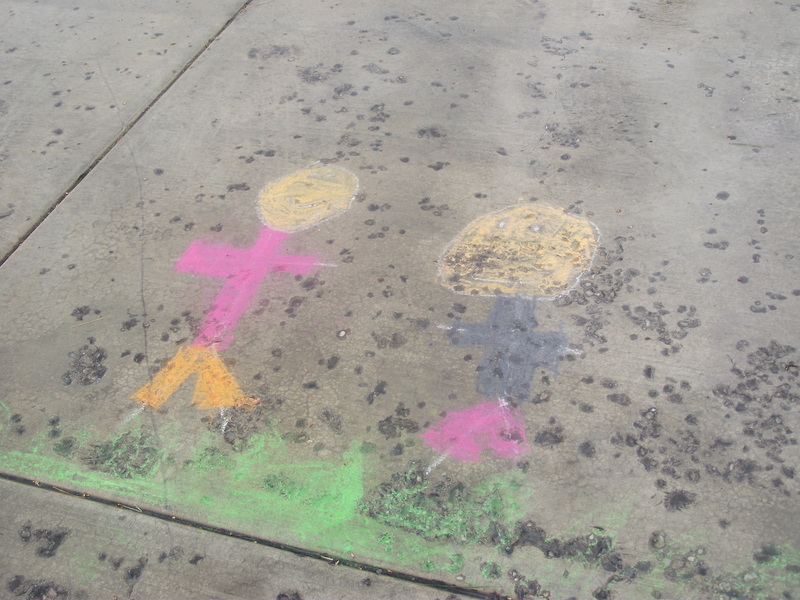 Colorful creations are always welcome on my driveway and sidewalk, even if they are just going to get rained and snowed on. 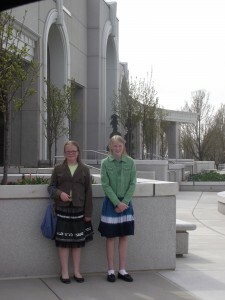 My girls wanted to go and do baptisms at the temple, so on Tuesday I took them there. The smaller kids and I did some errands and killed some time waiting for them. They said it was SO CROWDED and they had to wait a long time. 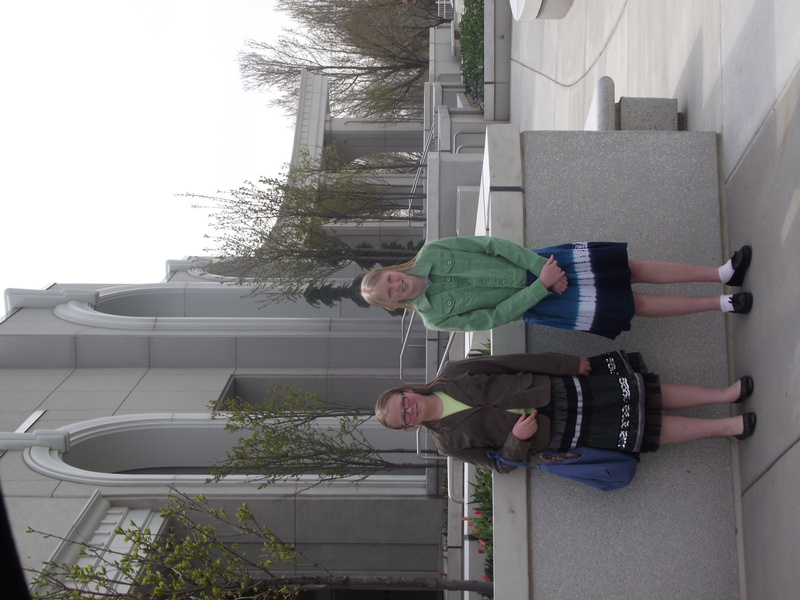 That just makes me happy that so many kids were doing temple service during their spring break! Wednesday we planned to go ice skating. I had checked the Peaks Arena website, and Wed was the only day this week that they were open early, so we got ourselves ready and over there by noon. Jenna, in particular, has really been bugging us to go ice skating. We tried a few weeks ago when we got an invitation from our mortgage company for a free night of skating, but when we went, it was SO CROWDED that we seriously couldn’t find anywhere to park. We just left. So, when we got there this time, there were hardly any cars in the parking lot! Which was encouraging, until we saw the sign on the door that said, “Due to mechanical difficulties, we will not be open until 2:00”. Ugh. That won’t work, as John had a baseball practice later in the afternoon. I had planned to skate from 12-2. There must be a curse on us that we can’t actually GO ice skating. Maybe roller skating would be better. 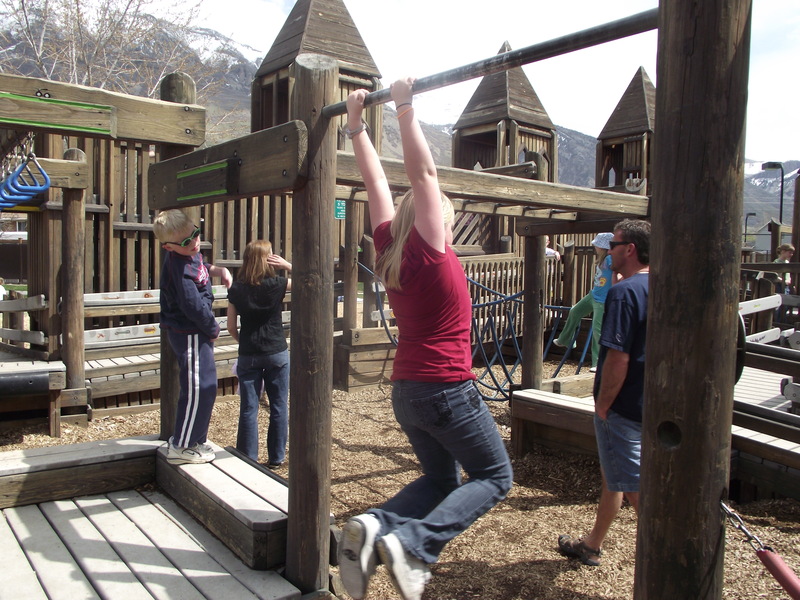 Well, I was scrambling for something fun (and cheap) to do, so I picked up food and we went to a fun park in Pleasant Grove. We had a fun time playing there for the afternoon, and got home in time to take John to baseball practice and the girls and I planted three tiny apricot trees in the yard. We still have three cherry trees to get to, but our days of sunshine and temps above 39 degrees have been limited. 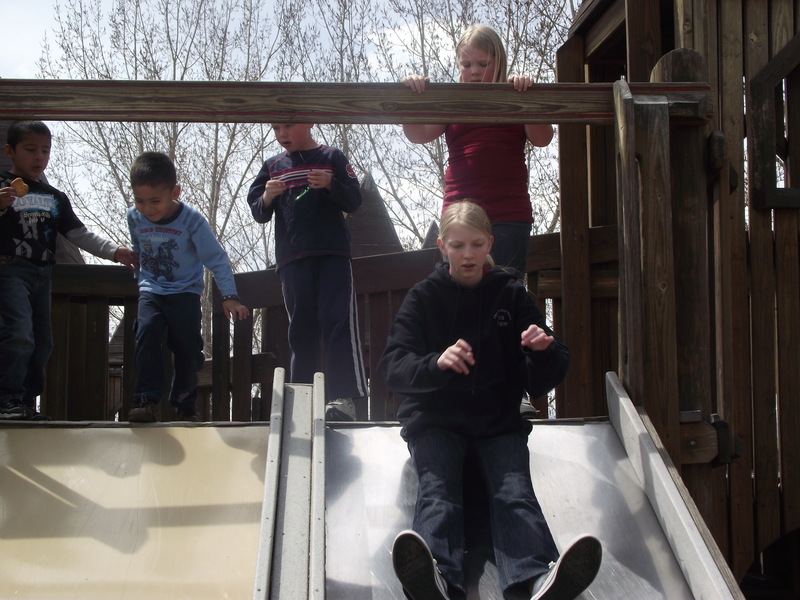 Thursday we decided to go to Thanksgiving point, to one of our favorite places, the dinosaur museum. 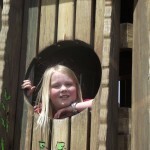 The kids can spend hours there, building, digging, and exploring. After 3 hours, we still had to drag John out of there. I decided on the way home that it would be a perfect date night for Ryan and I, so I stopped and picked up a couple of movies from redbox, and got tacos and pizza for them. Perfect! Then Ryan and I went to see Limitless. Not the best movie I’ve ever seen, but an enjoyable date night, nevertheless. Today is Friday, and I’ve promised to take a certain daughter of mine to buy shoes. And she’s nagging me almost to death. She’s got talent for persistence, that one. We’ve also got to make dinner and take it to someone in my neighborhood, and Megan gets to babysit tonight. Natalie gets to take care of the neighbor’s dog while they are out of town. So, as you can see, there’s still lots of ‘excitement’ around here. I’m hoping I can find friends for the kids to play with so they won’t just be hanging around the house all day. 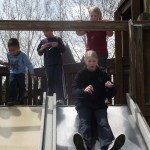 So, even though we haven’t done much, didn’t go anywhere, we’ve been enjoying our spring break week. Now, if we can just get a little bit more “spring” in the weather, that would help. 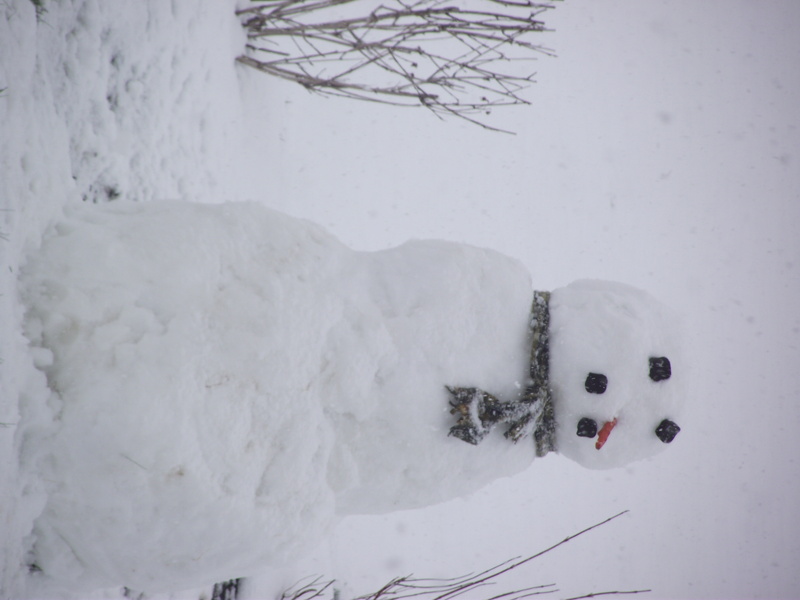 Well, our Spring break is starting off….cold. Snowy and 38 degrees isn’t my ideal weather pattern, but I guess we just enjoy our days off trapped together in the house. Sigh. Friday night, the elementary school hosted a beach party. 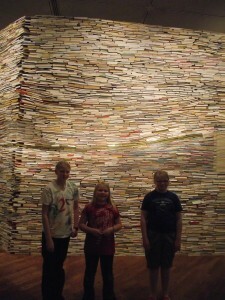 I wasn’t really sure what all that entailed, but the kids REALLY wanted to go. Hmmm. We were hosting a party for Megan and her friends at 7, but I agreed to take Jenna and John to the beach party from 5-7. And then I wouldn’t have to make dinner because I would feed them an overpriced hot dog meal at the school. 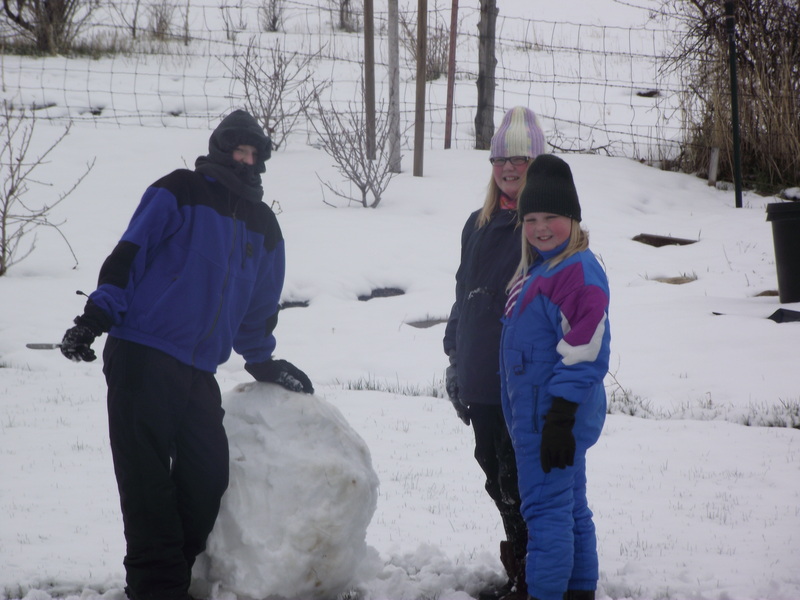 So, even though it was cold and snowy, we dug around and found whatever “beach wear” we could find, and headed off to the school after we picked up one of John’s friends. After eating our “dinner” and I use that term VERY generously, we headed to the gym where the dance action was happening. 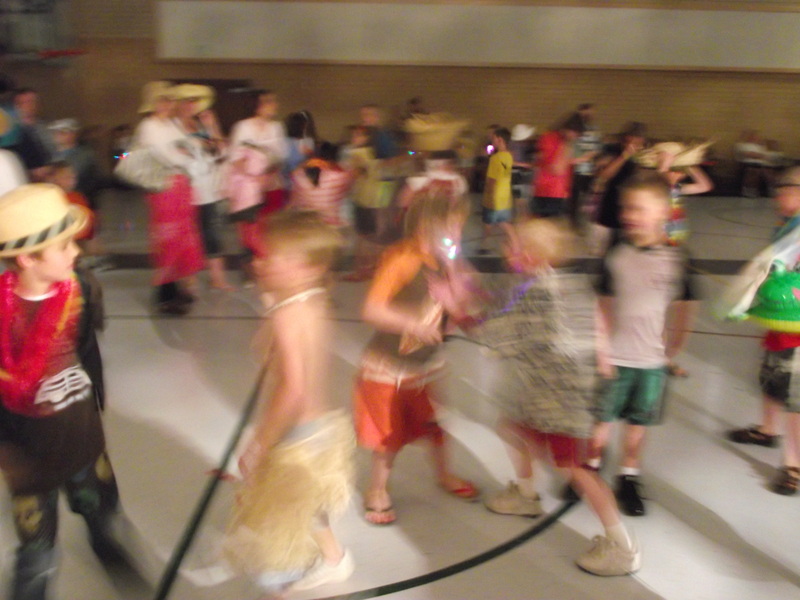 Imagine a whole bunch of kids, all in their shorts and flip flops, hanging loose on the dance floor. 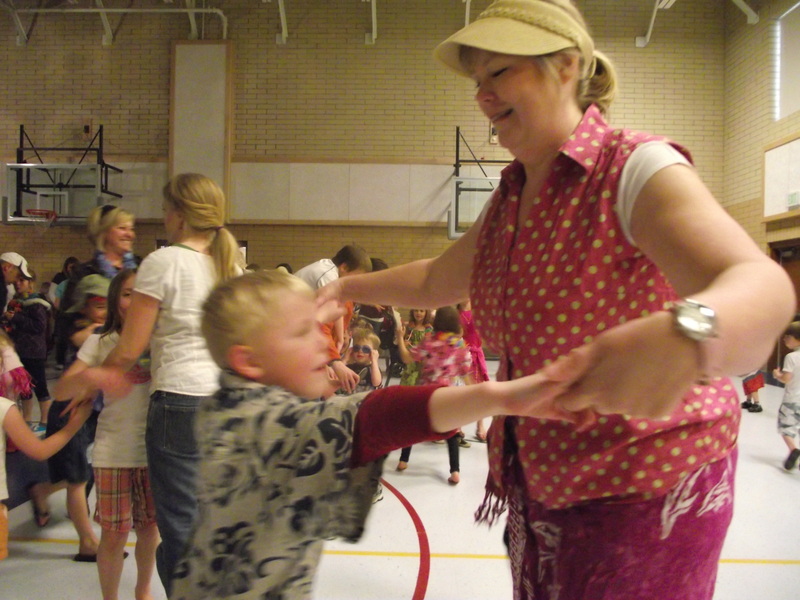 And many of the parents were dancing, too. John was such a wild and crazy dancer that I couldn’t really even get a good picture of him. 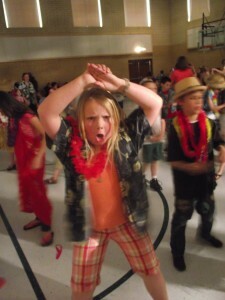 Jenna was gettin down, too! 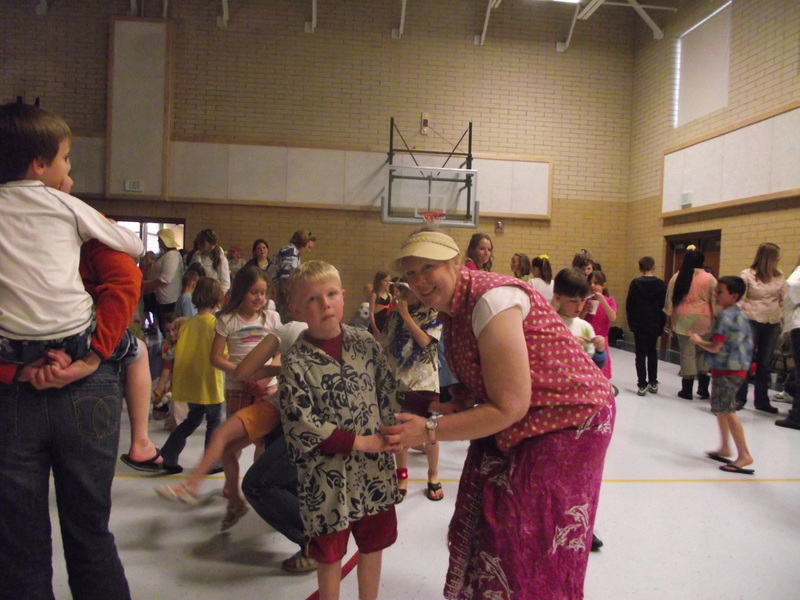 She even started a congo line with several friends, and it seemed like they were really having fun. The whole thing was put on not by the school or the PTA, but by the dance DJ, who had a discoball and everything. I think he brought the concessions, too. When they did a ‘parent’s dance’, I found my kids and forced them to dance with me asked them to dance. Whether they wanted to dance with their old mom or not. We didn’t stay all that long, however, because at about 6:30, John’s little friend came and found me and told me that he wasn’t feeling well. Uh, oh. I definitely don’t want a sick kids on my hands, especially a sick kid who isn’t even my kid. So, I told the kids we would leave in 10 more minutes. Luckily, they got to do the Hokey Pokey before I had to drag them away. 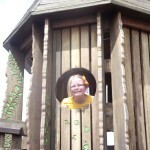 When we got home, Megan was ready and waiting for her friends to come over. They did come, and she had a fun informal ‘party’ of snacking, laughing and movie watching. We joined in to watch Inception (weird), which went WAY too long. The party was supposed to end at 10:30, and the movie went until 10:45. Sorry, parents. And since Ryan was out of town this week, I didn’t even have him to man the late night activities. Thankfully, the girls’ parents all came to pick them up and I didn’t have to drive anyone home. 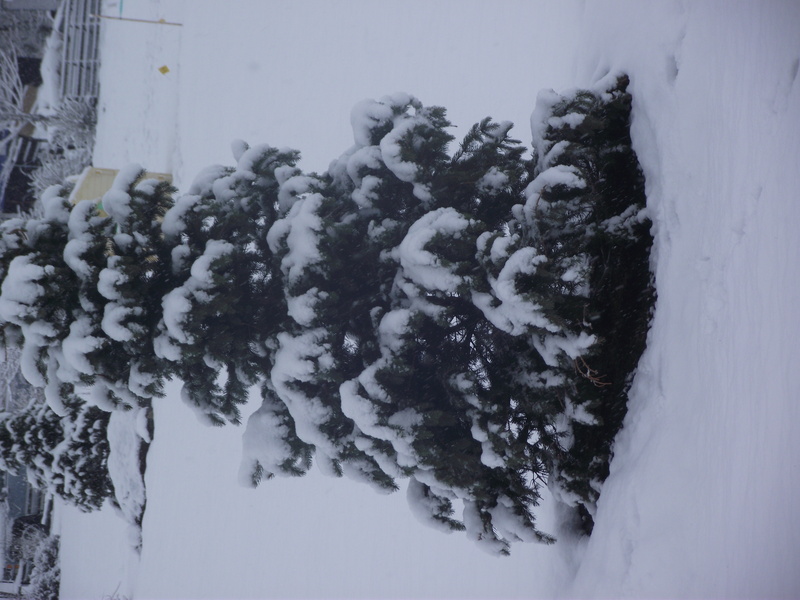 Saturday, we awoke to MORE snow. Ick. I told the kids to dig out the boots and snow stuff, because they were MAKING a snowman today! 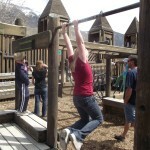 Less than enthused, they did actually go outside and have some fun there for about an hour. 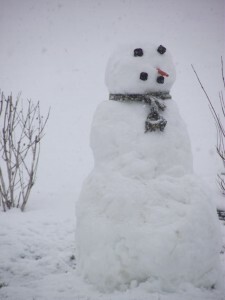 And make a snowman they did. 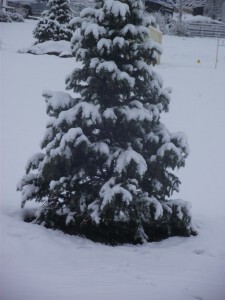 I have no idea how long this snow will last, or how long it will keep snowing. My hope is that it warms up by Monday so we can have a fun week of jumping on the tramp, riding bikes and playing with friends. It’s spring birthday time around here. Cole and Megan have birthdays 9 days apart. When they were little we used to sometimes combine the celebration, but now they don’t want anything like that. Cole is now 17. SEVENTEEN! How can he possibly be that old? Or more importantly how can I be that old? Ahem. Moving on. Cole had the misfortune of having his birthday the day after Ryan and I got home from our New York Trip. Or, if you want to get technical about it, it was the day we got home, since we came home VERY late the night before. He also decided to go and take a practice AP test in the morning. So, by the time he was done with that, we were all up and functioning, but we had no big party plans. Natalie volunteered to make a cake, but sadly, that cake wouldn’t come out of the pans, so it became a trifle. And not a very pretty one at that. He called from the test and asked if he could invite a few friends over and have a movie and game day party. Fine. So, that was his party. He and five or so friends watched Lord of the Rings 2 and 3, then played some games. I did my hostess duties and served food and stayed out of their way. Megan turned 15 on Monday. FIFTEEN! Now we’re going to have to go through the whole learning to drive thing AGAIN, and I can’t believe my baby girl is that old! Ack! Where has the time gone? For her birthday, I wanted to try to make it a special day, even though we weren’t having a big party, and it was a Monday. So I sent out a plea to my friends to all send her birthday texts throughout the day. Because she HATES to draw attention to herself or even let people know that it’s her birthday. 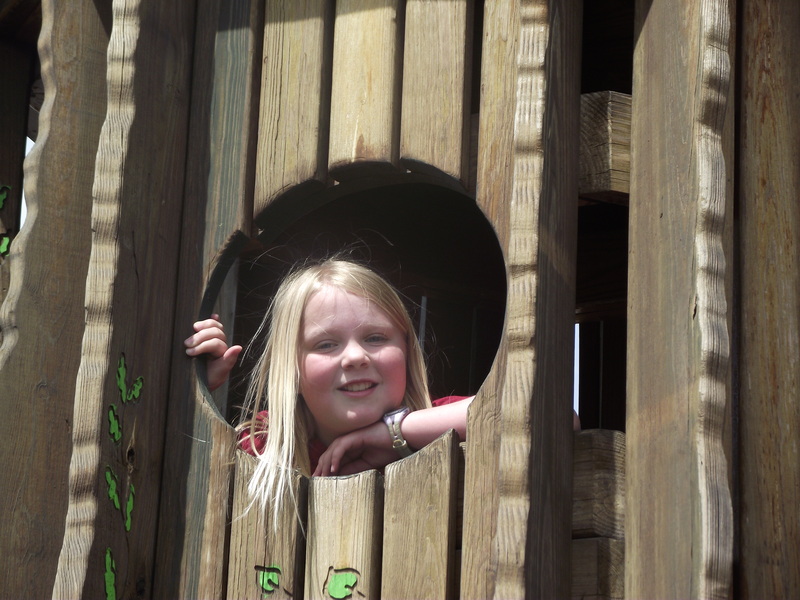 Whose child is she, anyway? Well, I can’t let her birthday just pass without her friends knowing about it, so I thought the text thing was fun. I also made little muffins and took them to my neighbor who was driving morning carpool and asked her to give them to the kids and tell them it was Megan’s birthday. Needless to say, she thought that was totally dumb. And I got a text from her specifying the fact that she didn’t need or want special treatment on her birthday. Ha! And then she got TONS of text messages from people she knew and didn’t know, wishing her a happy birthday. My old friend Ken Clayton, who now lives in Singapore, sent her a text wishing her a happy Birthday all the way from Singapore. Even though at first she told me she thought that was weird, hopefully she secretly thought it was cool, and it will make for a memorable birthday. Then we all went to Texas Roadhouse for dinner. 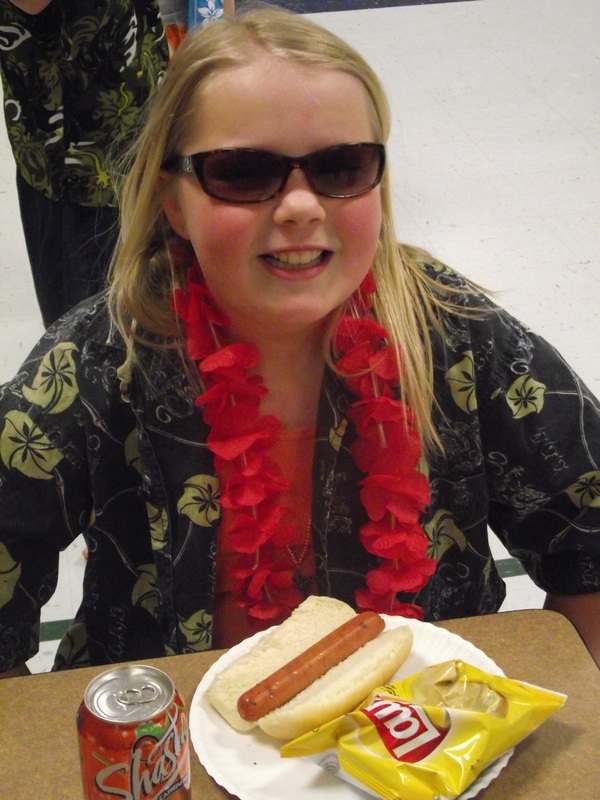 She’s also having a little informal friend party on Friday, where her pals come over and watch movies and play games. I’m not planning anything, and I’ll just break out some snacks and maybe a pizza. Easy birthdays! I hope they enjoyed their birthdays! These kids are really the greatest, and I love them both, even though they insist on growing older. Ryan is in Korea right now. Just a short trip, with about half of that travel time. Not my idea of fun. Actually, probably not anyone’s idea of fun. The highlight of the trip for him was going to be that on the way home, he has a layover in Japan and he’s excited to buy some Japanese candy from the candy store in the airport. Yay. Anyway, he sent me an email explaining that he was falling asleep in his meeting. And then suggested I try this to have the same experience myself. for the next 8 hours. * Take notes about the film on a nice, warm computer. Right. And he didn’t mention the whole “be on a plane for many many many hours” part. Funny Ryan. Well, hopefully he can stay awake through those meetings and do what he came to do. You may have forgotten that it’s the season of Lent right now, and that I’ve given up sugar for this time. I don’t know HOW you could have forgotten, but I have been trying to not be totally whiny about it, and if you aren’t doing Lent, then you might not think about it. Well, it’s still on. Until Easter, which is still a ways away. But I am hanging in there and doing very well. I haven’t had any break downs where I’ve shoved cookies into my mouth. I did make myself some sugar free lemon cookies a while back, and I ate “a few” of those that day, but since then, they have stayed in the freezer, waiting patiently for me to eat them. But, since I don’t want all this suffering and pain to be for naught, I am also really trying to eat well and cut down on the carbs as well, so I can lose some weight. And exercise. Yeah, that too, although I will admit that’s not my main focus right now. I’m NOT PERFECT, folks. And I’m not on a tv show competing for lots of money, either, so I’m doing what I can do. Well, since I have already taken ALL the joy out of life, why don’t we just cut back on the diet coke consumption while we’re at it. See if we can take Paige ALL the way to the edge of sanity and PUSH her over, shall we? I know my mom would be happier if I gave up the sweet sweet beverage that is diet coke all together, but I don’t know if we’re going to go there. It’s not like I’m drinking a 44 ouncer from Harts or Kountry Korner every day, but I do usually have ONE can of diet coke with lunch. Or, if I go out to lunch or dinner with friends, I will sometimes order a diet coke. But I will admit that diet coke makes me happy, and the thought of a life without diet coke makes me sad. Even that “Ptchssshhh” sound of opening a can of diet coke brings a smile to my face. Does that make me an addict? I don’t know. It’s like I’m at a meeting. My name is Paige and it’s been three days since my last drink. And then we sit around and drink coffee and eat donuts. Except that I don’t drink coffee and I can’t eat donuts! And so I’m grumpy. OH SO GRUMPY. 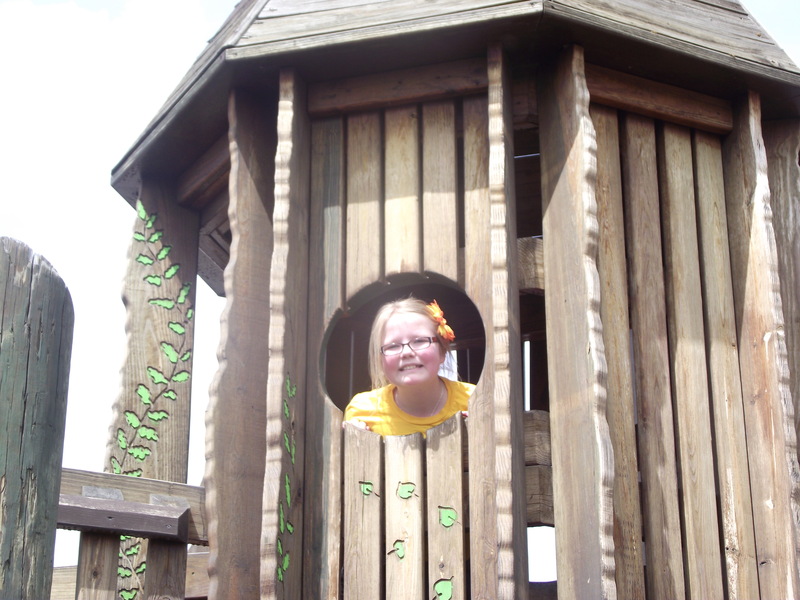 We went out to dinner on Monday for Megan and Cole’s birthdays, and went to Texas Roadhouse. And (here’s the part where you need to be proud of me) I didn’t have a single roll. Not one. Can you believe it? I ordered a grilled chicken salad and ate it while looking longingly at the kids’ fries and sticky ribs and chicken fried chicken. Should have ordered the steak and a sweet potato, but I ate my salad. Come on! Who orders a salad at Texas Roadhouse? Stupid people, that’s who! And water. I drank water. It was a fun dinner out with the family, but I came home and felt all sorry for myself. And to avoid grumping at my kids, I hid in my room and devoured…. a book. You thought I was going to say I had some secret stash of reeses peanut butter cups hidden in my bedroom and I went in and secretly ate it, didn’t you? No. I was good, and I read a book. Thankfully, the scale moved a little bit in the downward direction the next morning, or I probably would have just THROWN all the good intentions out the window and snarfed a cupcake for breakfast. I still might. You don’t know. Some friends have invited me to lunch today, and I’m still debating. The place they want to go has really good salads, and I would probably enjoy being with friends. But would I again feel sorry for myself because other people might be ordering cookies and brownies and great sandwiches? Maybe I’ll treat myself to a diet coke. Just one.